From Release: Equipped with original member Brett Scallions’ legendary distinctive voice that transformed Fuel into a quintessential rock radio staple, hard-rock fanatics are sure to hang on every thumping bass note, wailing guitar lick and pounding drums. Fuel continues to build upon a legacy of captivating performances that Brett and the band have trademarked over the decades. 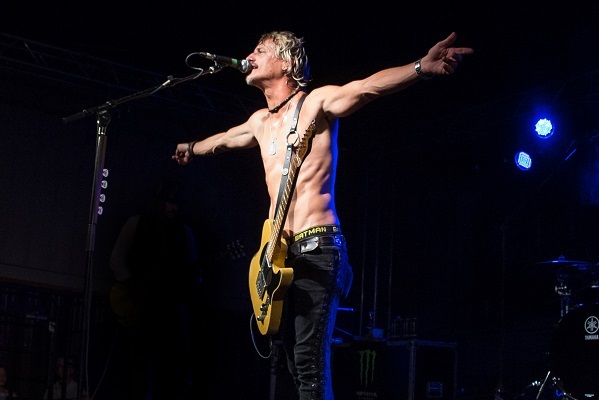 Fuel are on a mission to once again deliver their trademark brand of heavy-tempo, in-your-face attitude rock at venues across the country. These are sure to be the Fuel shows you know and love – fiery, explosive, packed full of bodies flailing and sweat dripping from the ceiling. We’re warning you, Fuel is not to be missed! While in Dallas, Texas we gave Brett Scallions of Fuel a call to talk about their return to Australia after so long away, the 20th anniversary of ‘Sunburn’, new music and much more. We’re here because you’re finally heading back to Australia! After so long away how will you be shaping up these shows set wise? Oh man we are super excited about being in Australia again, man, it’s been far too long and we’re celebrating the 20th anniversary of the ‘Sunburn’ album officially next year but I think when we come in in December we’re gonna play a lot of that album for the people you know? So if I go ahead and go early in and celebrate the 20th anniversary with you guys, why not right? As a Fuelie from way back I have one request, any chance you can please play ‘Bad Day’ and ‘Falls On Me’ in Sydney? Oh absolutely, we’re not just gonna play only the ‘Sunburn’ album we’re gonna play everything that we can possibly fit into the show. Luckily we’ve got a large catalogue of music to choose from and we’re gonna play as long as we can. Last time you were in Australia was back in 2003 on an acoustic promo run for ‘Natural Selection’ which was amazing, what are you looking forward to most about coming back after so long away? The people first and foremost, every time I’ve been there the people have been so incredibly nice and hospitable and just die hard music fans and I just love to see that and so we’re excited to just be able to play the songs. You guys live in such a beautiful area there, the beaches are amazing and the food is amazing, so there’s so much to enjoy about Australia. Next year marks twenty years since ‘Sunburn’ was released. What’s your best memory of releasing such a big album for you guys? Oh wow, I think one of the most memorable moments for me was when we officially signed our deal and we made the record and ‘Shimmer’ was the first single and we were still very much a baby band and still getting started so people were just starting to gain a little sense of awareness about us. I remember driving into New York City and listening to K-Rock and our single ‘Shimmer’ coming on K-Rock and that was that first moment to me of just like wow it’s beginning *laughs* this is about to really start, so it was an exciting moment to hear what we worked so hard on in the studio and finally there it is on the radio and being embraced by a powerful station like K-Rock so it was a good time. To this day a song like ‘Shimmer’ still gets radio play and is still so loved, what do you think it is about that song that people attached to so much? You know what is it about any song that people get attached to so much? It’s like sometimes songs are just done right when it comes to the writing and the performance and the people that are involved, it just all comes together in a proper way and the beauty of having something like that happen you get very lucky when you become part of songs that dare I say become timeless to where they don’t ever sound dated, they always sound fresh and current and I think that’s what we have with some of these songs. Well for me that happened when I went to The States in 2001 and the first song I saw on VH1 was ‘Bad Day’ and it just stuck with me since then. Oh wow that’s so good to hear, the second album didn’t quite have the impact in Australia as the first one did which was odd for us because here in The States the second album was even bigger, so it’s nice to hear some of those songs crossed over and made it to Australia and were well received by people like yourself. In terms of new music we had ‘Puppet Strings’ in 2014, are there plans for a new album anytime soon? Well we will be playing some pf the songs off that album when we come to Australia and we’ve been toying around a little bit with the song ideas and the tour that we’re on right ow ends I’ll be home on Sunday so if I’m lucky I’ll be able to get home and sit down in my office in my little studio there at home and kind of flesh out some ideas and prepare for some new material for next year. Big fan of ‘Soul To Preach To’ does that ever get a run in the set? I’ll send you a set list. With now taking on the writing duties, how if in any way does the process of singing the songs differ for you compared to when Carl would write the songs? Well definitely there’s more freedom on my part, I’m able to and I have the freedom of saying what I want to say and doing what I want to do and I’m not clamped down by anything, but with that said I like writing with other people, I love it because I always come from the idea that two heads are better than one sometimes, and I like having someone in the room with me that I can bounce ideas off of at times. There’s been so many times I thought I had something cool and someone else says “why don’t we try this instead” and it takes it to a next level, which is refreshing for me. The difference now versus in the past too is that I do have some more freedom to be creative and artistic in my own way. Obviously over time things change but what would you say is the one thing that’s stayed the same about Fuel? Oh boy that’s a tough question… The music is still there always, and I’m there and at the end of the day it’s hard to translate any kind of music when there’s not the original force, so that’s one good thing we’ve got to our advantage is it’s actually me who is singing all these songs *laughs* and performing those songs, so it’s always gonna sound like Fuel as long as I’m up there. So I would guess that that’s probably the main thing that hasn’t changed is me. By the end of 2017 Fuel want to… oh boy… be prepared for new music, be prepared to continue doing what we love to do, play music, make music, write music, record music. Absolutely, I mean we’re in a day and age now where you’ve gotta give music away practically I mean not even practically, literally you’ve gotta give music away. Music is nothing but a calling card these days, so the negative effects of that is you’re not gonna be selling music and making that share of revenue that used to be so much relied on, with that said you kinda can have the freedom a little more to say you know what? To hell with it I’m gonna write exactly as I wanna write and I don’t have to worry about anything but just trying to write the music that I wanna write, I’m not gonna try to focus on trying to top the last hit or make something similar to that song because it was such a hit. If you’re giving the stuff away you might as well play what’s coming from your heart in the first place. So that’s what I enjoy doing. Tickets: https://metropolistouring.com/fuel on sale now!